I'm now requesting role-players to role-play ShadowWhisper and Lurkingflame's kits. Physique: Hazelkit is not heavily built, but very strong and isnt someone to mess with! She has a fluffy white pelt with ginger patches and has her mothers eyes but definatly not her Personality! Personality:Hazelkit is an outspoken kit with a quick temper. She speaks whatever what's in her mind and can lash out on others quickly. She is very independent and adventurous and will sometimes beg patrols to let her come with them during her patrol. Hazelkit is protective over the cats she cares about. Physique: When shes a warrior, she will have soft, pretty features and a fluffy pelt like Shadowwhisper. Shes not too thin, not too heavily built, but just the perfect size! She has a fluffy calico pelt with her mother's eyes. Personality:Leafkit is a soft spoken kit with a positive attitude. She hardly says anything negative and keeps her negative thoughts to herself (Opposite of Hazelkit). She is very sweet, nice, gentle, loyal and its hard to get on her bad side. She often hangs around cats that she's comfortable with-- like her mother. Physique: Patchkit will be a very lean, fast warrior like his father. He will be very very slender with a long winding tail. He has a short, black and white pelt with the same markings as his father and light sulfur eyes like his father. But his personality is nothing like Lurkingflame! 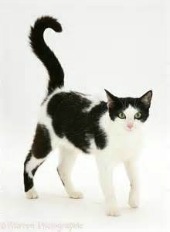 Personality: Patchkit is an energetic tom that can never quite sit still! Some may say he has ADHD, when hes just really really hyper! Physique: When Lynxkit is a warrior, he will be a very, very large, strong, broad shouldered tom with a chiseled chin. He has a very short, light ginger pelt with his father's sulfur yellow eyes. He has black markings above his eyes and down the sides of his eyes leading around his muzzle. See picture if you dont understand :3. The tips of his ears have very long, bushy tips which give him his name. He got these traits from his great grandfather who had these markings. Personality: Lynxkit is a proud, sometimes arrogant tom but he has the right to be! He will make an excellent fighter. Hes very adventurous and loves to play! But knows when to turn it down a notch, unlike his brother. Mood: "Clap along if you feel like room without a roof..."
Thoughts: "Could I really be deputy someday!?" Mood: "Take five deep breaths. In through the nose, out from the mouth." Thoughts: "I sometimes need my space, thats all." Thoughts: "We need some fun around here!" Thoughts: "Quite! Im trying to think here..."
YAY we only need one more to go ^^ who will take pretty little Leafkit? Nothing, I just said that for no reason what so ever. XD I don't know if I want her since I have my hands tied and have to keep up with the forum so I may not. How active are you from one to ten? : 10, when I'm not grounded. Which isn't often. Thanks Waterpool!^^ All of the kits are now taken!